Stop throwing away your hard earned money on disposable bladder control pads or liners. Try our eco-friendly and reusable PuppyBellyBand Liner Pads instead. We design PuppyBellyBands Liner Pads to wick moisture away from your dog’s skin and reduce the risk of irritation by using super absorbent, durable and natural materials. Once your dog soils the pad, simply throw it in the washing machine and your PuppyBellyBand Liner Pad will be good as new! Try our PuppyBellyBands Liner Pads today! Save $2.51 when buying 4 pack of the Super Soaker PuppyBellyBand Liner Pads! Get extras s.. 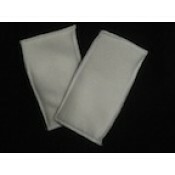 The Super Soaker pads include a singular super absorbent, natural micro-fiber layer with a wate..